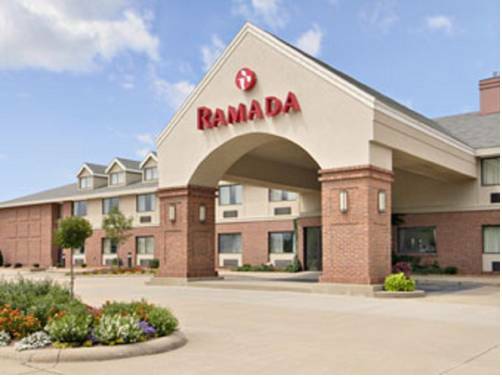 Ramada Vandalia offers Hotel Rooms near the Vandalia State House, St. Louis, Archway Sky Diving, Fayette County Speedway, and Indian Springs Golf Course. Free High Speed Wireless Internet, Free Continental Breakfast, and Group Discount Room Rates and a few features of our Hotel. New total Renovation in 2006 with Serta Plush Beds lull you into a perfect sleep. A fully stocked Ramada Mart open 24 hours for your convenience. Our Complimentary Deluxe Continental Breakfast proudly serves up freshly made Belgium Waffles to begin your day right. We are adjacent to the Ponderosa Steak House who gladly will deliver room service with pleasure. Come see Historic Vandalia Illinois where Abe Lincoln began his political career. The Vandalia area is rich is many historic sites. A water tower painted to resemble a bottle of Brooks Tangy Catsup.